Top of the morning to you all! First, Garden Club is one week early this month! We will be meeting tomorrow, Tuesday, May 6th at 10 AM and 6 PM and on Wednesday, May 7th at 10 AM. Remember, you just have to show up at any of these times and don't forget your Show-N-Tell! 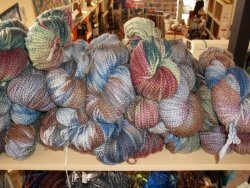 Second, all of our yarn has been moved to 40%-70% off! 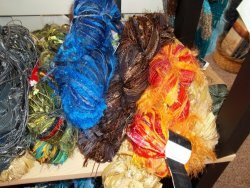 We still have lots of unique yarns to choose from so stop in this week. We are located off Interstate 80 which travels across northern Illinois. Take exit #56 and head south into Princeton. (This is Route 26 and also becomes Main Street.) Travel about 2 miles and you will find us at 527 S. Main Street (on the left or east side of the street).